You know what badass lady has a delicate tangerine tint to her skin?! 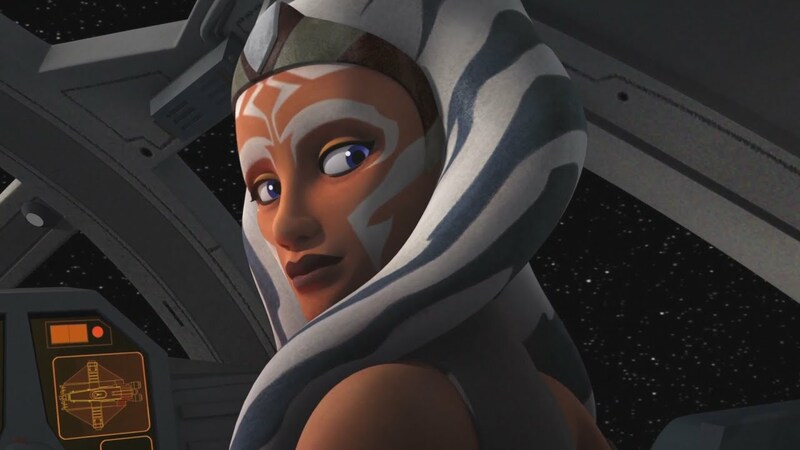 You guessed it: my hero, Ahsoka Tano! And then she arrived and I was so happy! I considered doing an unboxing video, but eventually decided that I’m not that nerdy. (False. I just didn’t feel like setting that up because it would mean waiting longer to be with my little Ahsoka). Look at my stupid, happy face! I can’t upload my own videos on here, but I want to because this Ahsoka Tano Funko Pop! Bobblehead is the greatest bobblehead ever! It’s probably her Togruta lekku that makes her bobble so epic. Ashley Eckstein is rocking her Her Universe (do I have to tell you she’s the founder of Her Universe?!) Captain Phasma leather jacket and that beautiful Ahsoka’s Journey shirt (that I also have and it’s one of my favorites). Then, the author herself is wearing a Jedi cowl dress from WeLoveFine designed by the lady who runs her own Geek-chic line, ElhofferDesign. Not that you should necessarily judge people by what they wear…actually, I can’t say that with honesty. I do judge people by what they wear, but in a positive manner! If you’ve got a Rolling Stones shirt or some Star Wars apparel on, it’s just more likely that we will get along. I love fashion and I love all sorts of looks, and it’s amazing to see this nerdy girl fashion so often now. I’ve just always been attracted to expressive clothing, so naturally I love seeing that on other people as well. 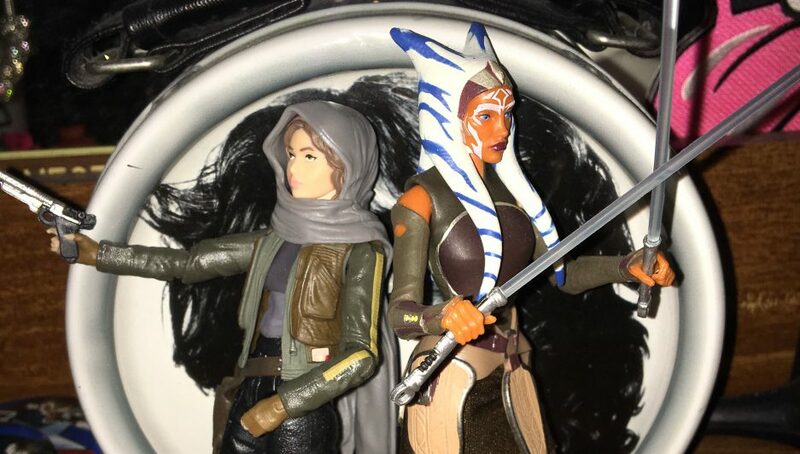 Also, you should always dress for the occasion, and they’re both perfectly dressed to do meet and greets for the long anticipated Ahsoka novel. I’m just so excited for this book to come out, I wish I could burst into Barnes and Noble at midnight! I remember my friends doing that for the Harry Potter books back in the day; I was never into them enough. In fact, I’ve never been super excited for a book to be released, or least not a fiction novel (not counting autobiographies of my favorite rock stars). I’ve always discovered my books years after their release with very few exceptions. I didn’t even fall in love with the Hunger Games after I saw the first movie in theaters and decided I wanted to read the books, but if I was a fan prior to their releases, I would have definitely joined the madness waiting for the books to come out. I often only find my beloved books after seeing the movie version. So this truly is the first time I’ve been waiting months and counting the days until a new novel is released. Why am I excited, you ask? Oh gee, it has nothing to do with my obsession with Ahsoka! (Sarcasm). But, besides my insane love of this fantastic character, I’ve been really impressed with the Star Wars books that have been released within the last year and a half, especially Dark Disciple and Bloodline. I never read any of the Legends/Expanded Universe books when I was younger; I only liked the novelizations of the movies. For whatever reason, I didn’t crave more. I was fine watching the movies and the special features over and over on my fancy DVD set for several years. Now, that is obviously not the case. Opening myself up to the Clone Wars series was one of the best decisions I’ve ever made! It brought me to my beloved Ahsoka and honestly, a deeper understanding and love of and for the prequels as well Star Wars as a whole. OH! Do you know why Ashley Eckstein is tagging along for the book tour?! BECAUSE SHE DID THE AUDIO BOOK!! I’ve never bought an audio book, but this will have to be my first time exception. It’s just too perfect and glorious to pass up. Also, what are your favorite Star Wars books? !